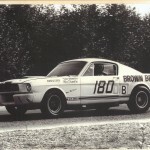 Originally, Shelby GT’s history started because of Ford’s wish to enter Sports Car Club of America races [SCCA] where the cars were 2-door coupes only. 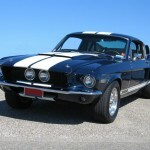 In this case Ford made a contract with Carroll Shelby back in 1964 when Shelby was already known famous for his driver experience and his phenomenal car – Shelby Cobra. The first GTs were Shelby modified K-Code 289 cubic [4.7 liter] V8 Fastbacks that had their power increased from 271 HP up to 306 HP. 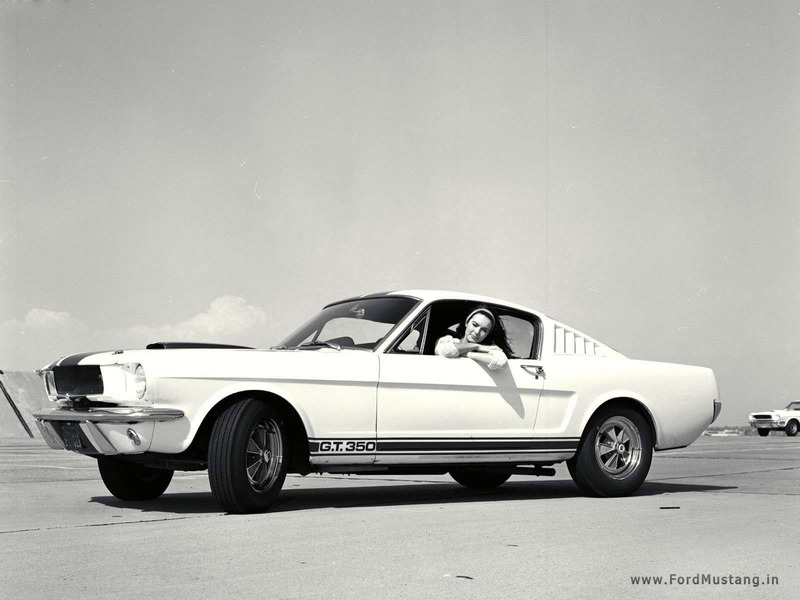 Shelby ordered 252 units of 1965 Fastbacks for his conversion into 1966 Shelby GT350. 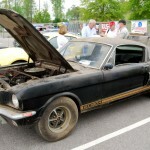 The project itself began in August of 1964 and in September the first Shelby GT350s were born. The public unveil was done on January 27 of 1965. 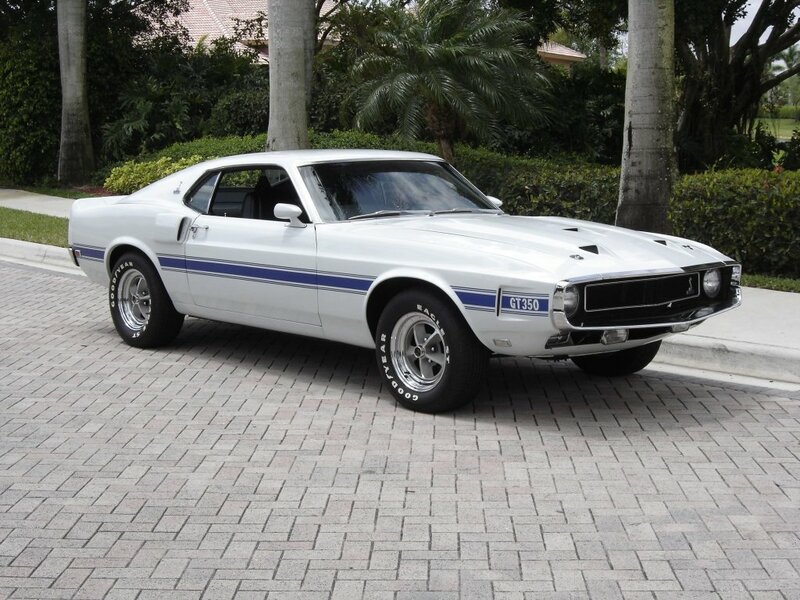 Shelby GT350 also featured Hooly carburetor, Cobra valve covers, special Cobra hi-rise intake manifold, 4-speed manual transmission, side exhaust pipes, Wimbledon white body color with 2 stripes and no back seats, because of SCCA’s requirements [2-door coupes only]. 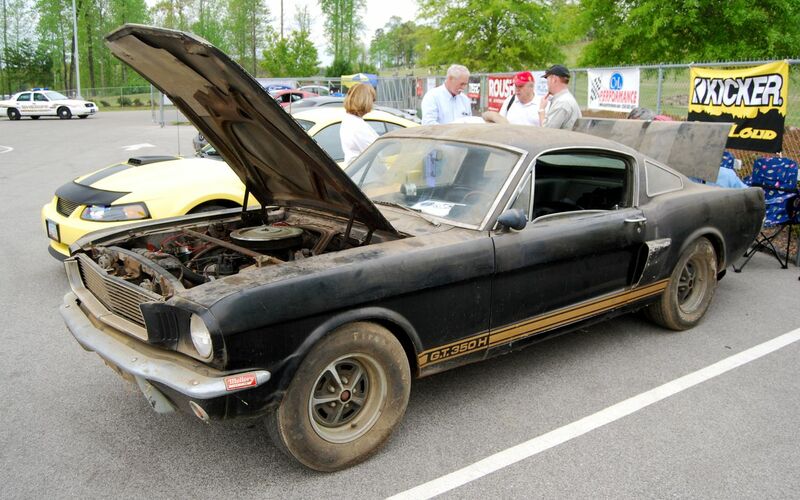 All in all, there were 562 Shelby GT350 street legal and 37 GT360R units built in 1965. 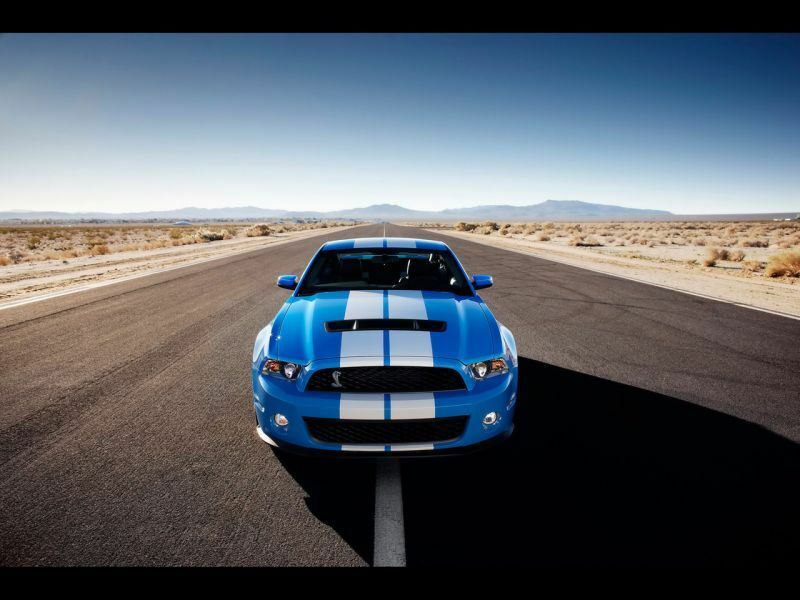 The Shelby GT350R were built for races only. 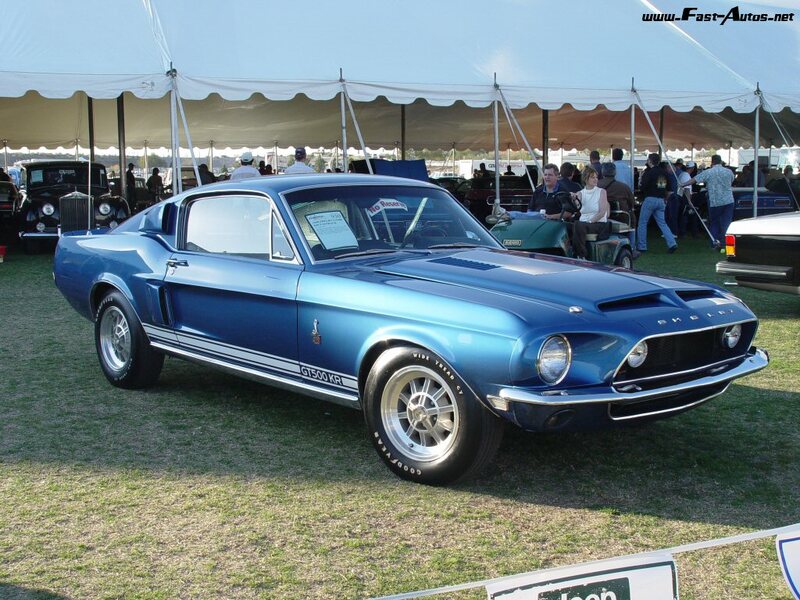 The 1966 production had 2378 GT250s built where 4 of them were special order convertibes for Shelby himself. 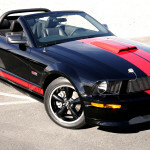 Some say, there were 6 of these convertibles, but on 4 correct VINs are discovered. 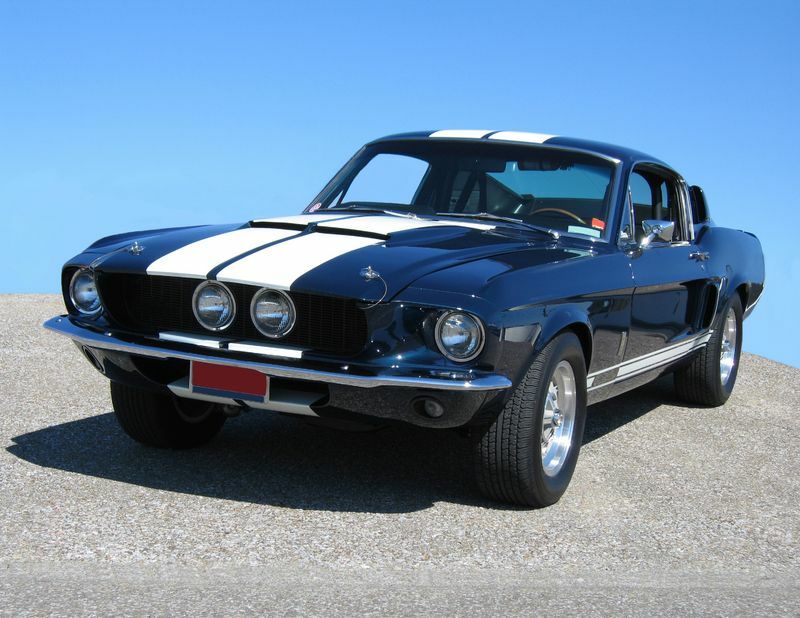 Shelby struck a deal with the Hertz Corporation in 1965 in order to build a special line of 1001 1966 GT350H V8s for “rent a racer” program, which helped Shelby to expose Shelby Mustangs across the country. 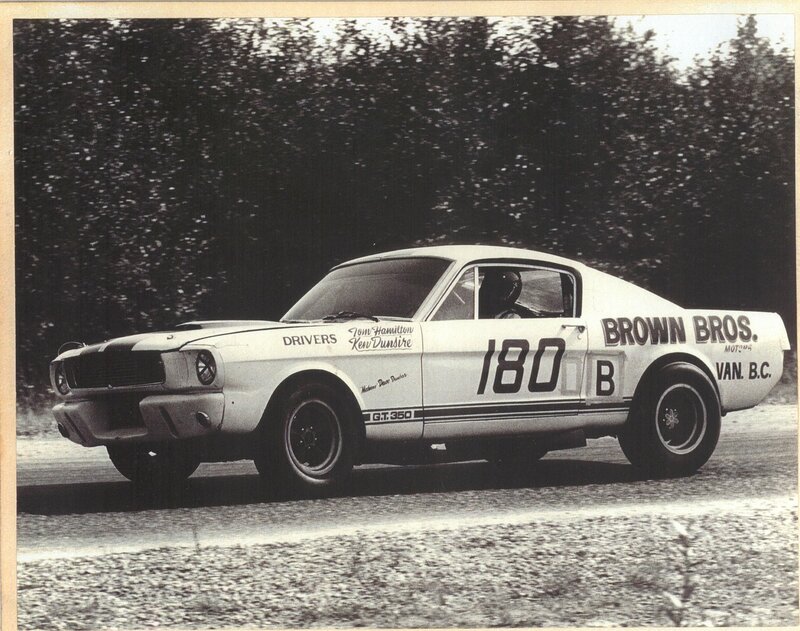 In 1967 Mustang Gt350 carried over with 289 cubic aluminum Cobra V8. Regular Mustangs could get 320 HP power by installing 4-barrel carburetor. 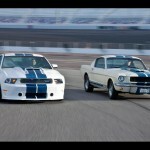 Of course, Shelby went further and the new Shelby GT500 model was built in 1967 too. It was equipped with reworked 428 cubic [7 liter] Police Interceptor engine with cast-aluminum intake manifold [from Ford’s 427] and twin Hooley 4-barrel carburetors to get 355 HP. 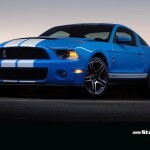 GT500 had a 4-speed manual or 3-speed automatic transmission, power steering and air conditioning. The body had new nose, functional hood scoop, side body air intakes. 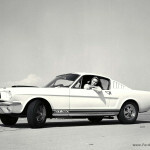 The 1968 Shelby GT500KR [King of the Road] had 428 cubic Cobra Jet V8 engine and developed suspiciously low 335 HP. 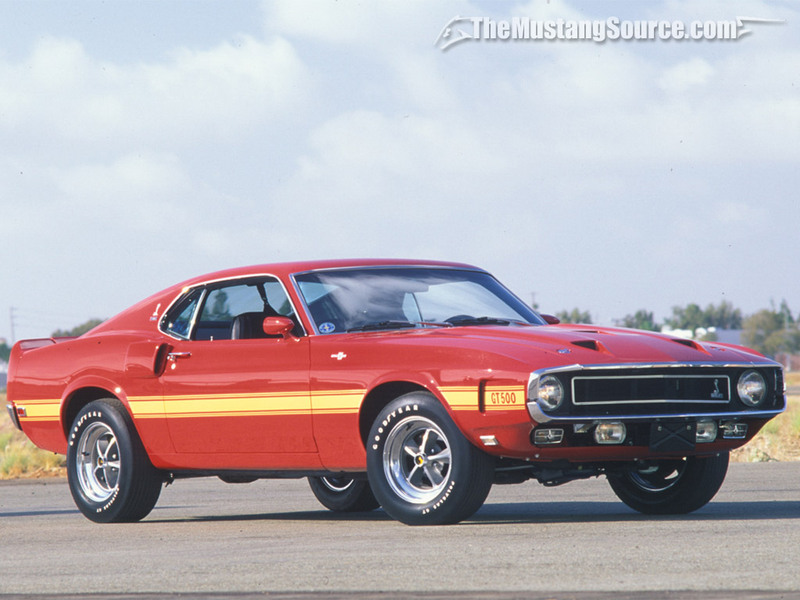 Shelby terminated the agreement with Ford in 1969, but he still had a little bit of his impact in 69-70 GT model range. 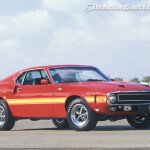 Actually, the 1970 GTs were 1969 Shelby leftovers and that is why 1970 GTs were still Shelbys. The GT350 and GT 500 got quite a big facelift change. 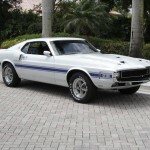 1969-1970 Shelby GT350 got a 351 cubic [5. liter] V8 engine, while the GT500 got its 428 cubic [7 liter] V8 muscle. Transmission choice was the same: 3-speed automatic or 4-speed manual. 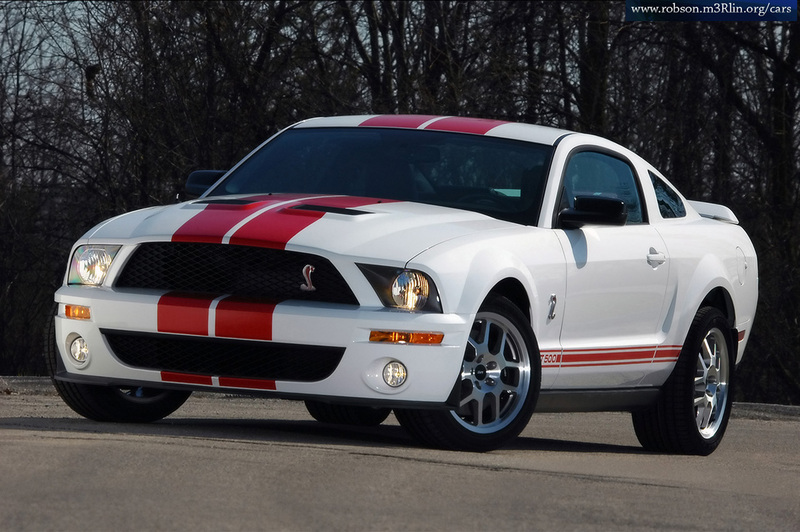 After Ford revived the 5th generation Mustang, Shelby created a special edition 2006 Shelby GT-H which was the offspring of the original 1966 Shelby GT350H “rent and race” muscle car. Only about 500 units were built. Those were equipped with 320 HP 4.6 liter GT V8 engine, 90 mm cold air intake kit, X-pipe, performance suspension, 5-speed automatic transmission, etc. 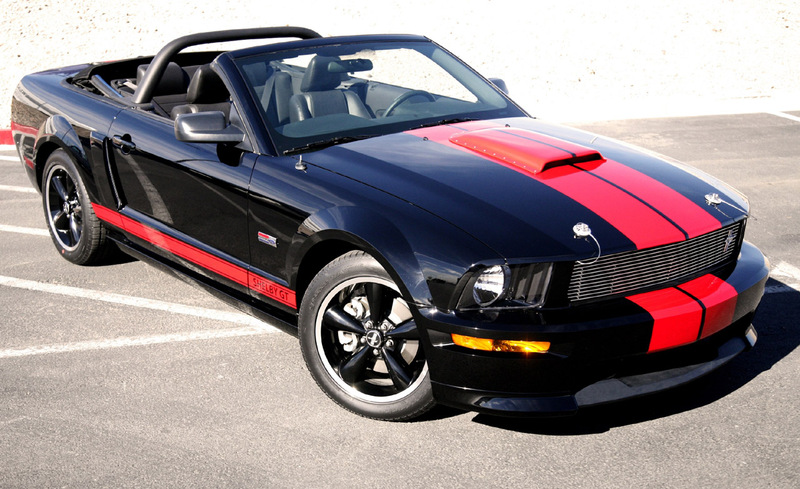 The convertible Shelby GT-H was offered to rent in 2007. 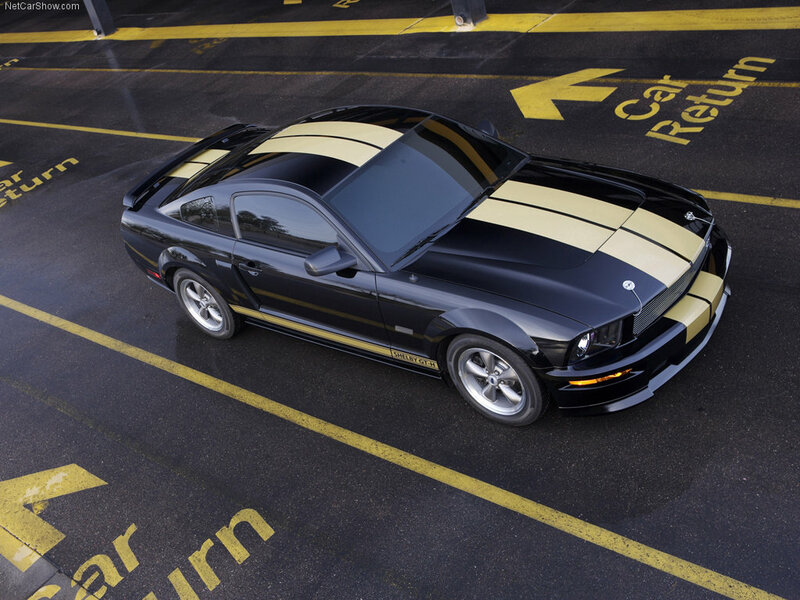 There was one more special edition of 100 units unveiled in 2008 – the Barrett-Jackson Shelby GT. 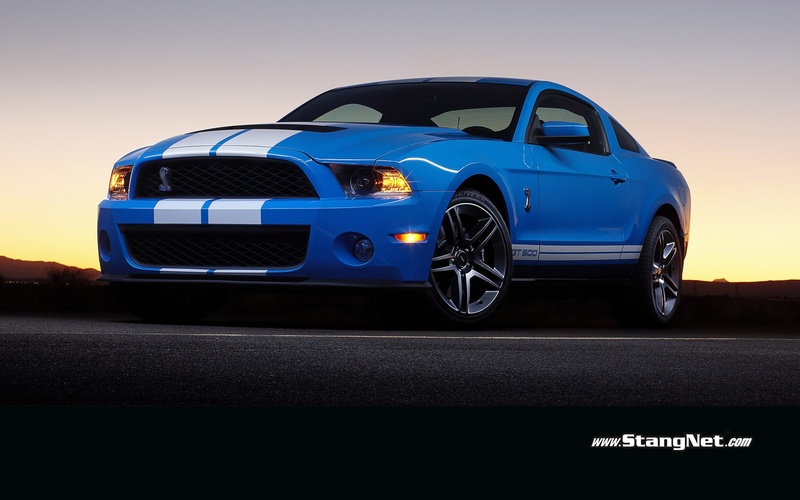 The Shelby pony delivers 319 HP from a Ford Racing V8 and is equipped with 5-speed manual gearbox that has Hurst short-throw shifter or a 5-speed automatic. 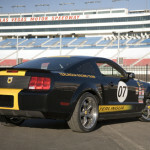 The cars have special tuned dampers, unique sway bars inside and 18 inch alloys, Shelby Cobra hood scoop, Lemans stripes and fully black interior. 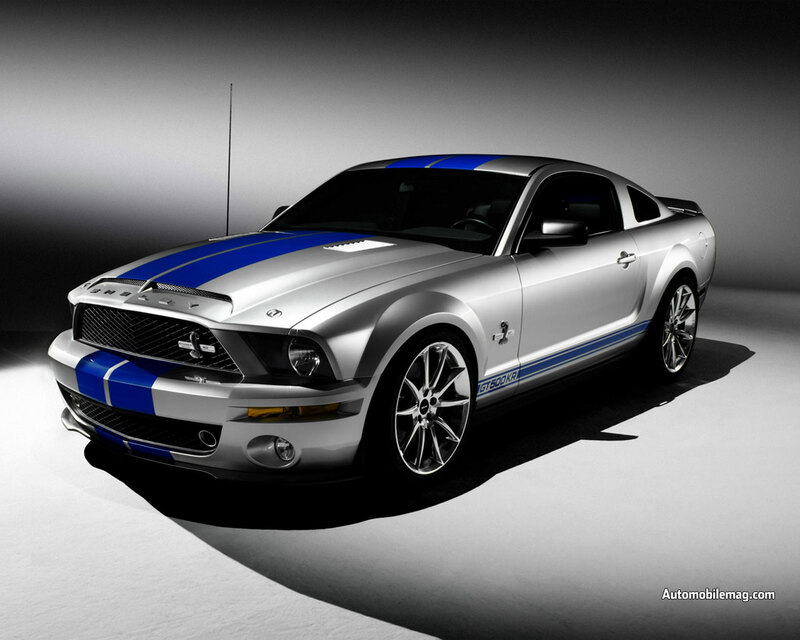 The 2006 Shelby GT500 uses 5.4 liter supercharged V8 and develops 500 HP. It also features 6-speed Tremec manual transmission, has some suspension tuning done and rides on 18-inch wheels. 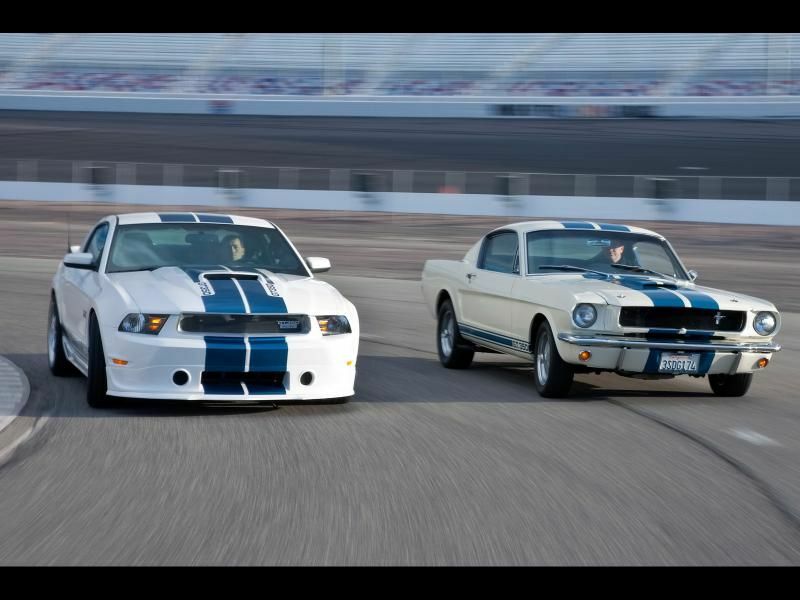 These cars were build in collaboration of SVT and Carroll Shelby for 3 years only, but there were about 30.000 units built. The King of the Road model was unveiled back in 2007, in NY auto show. 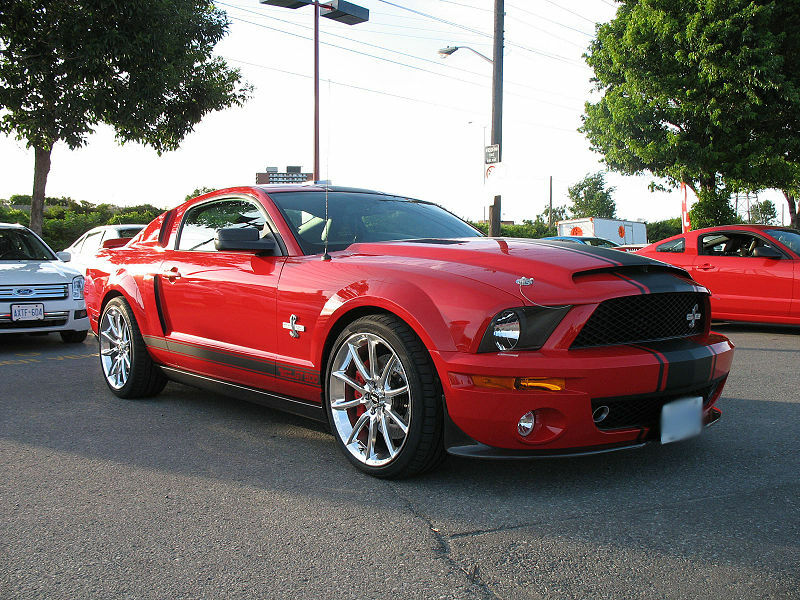 The Anniversary 2008 Shelby GT500KR has the same engine as GT500, but due to functional cold air intake and unique calibration this 32 valve 5.4 liter supercharged V8 engine develops as much as 540 HP [40 HP more than GT500]. The KR Mustang features carbon fiber hood with functional scoops and vents, unique carbon fiber splitter , functional brake cooling ducts, SVT-tuned suspension, some more parts from Ford Racing. 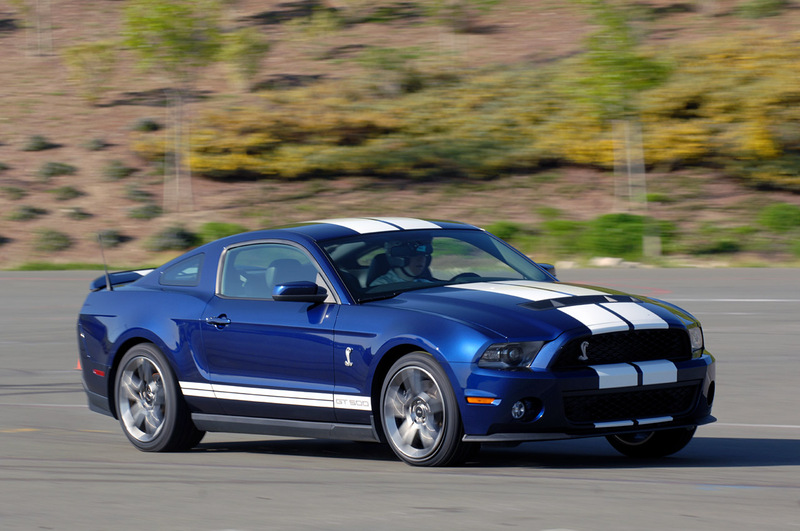 If You already have GT500 and still feel unsatisfied, You may sent it to Shelby’s Special Performance Plant in Las Vegas and have it rebuilt into Super Snake. This rebuilt SS features some special badging, new Alcoa wheels, ram-air SS hood, stripes, splitters, 6-piston Bear brakes and many other performance features including the 5.4 Liter Kenne Bell twin-screw supercharged engine that develops 605 or 725 HP [no warranty for this one]. 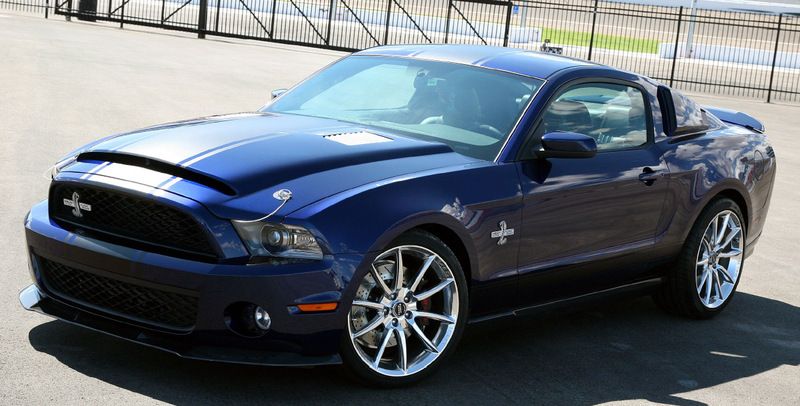 Along with the 2010 Mustang facelift came the new GT500. 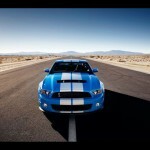 It had the same 5.4 liter engine but the power was increased up to 540 HP by adding cold air intake [similar to KR’s]. SVT retuned the suspension a bit by adding 19 inch wheels. 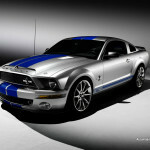 The 2011 Shelby GT500 will get an engine update – it’ll be the new 5.4 aluminum V8 that is 102 pounds lighter, and more powerful – 550 HP. The car stance is lowered by 11/8 millimeters in front/rear. The steerig is assisted by new electric system, external design includes SVT performance package, 19/20 inch front/rear wheels, optional glass roof, etc. 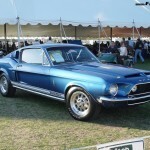 Due to 45th Anniversary in 2011 the legendary 1965 Shelby GT350 special Mustang edition was unveiled by Shelby. 5.0 liter small block V8 will be fitted with Ford’s Racing [FR] supercharger to gain 500 HP, FR suspension, 6-speed manual transmission, Borla exhaust, 6 piston Baer brakes, 19 inch Cragar wheels, front splitter, functional hood scoop, redesigned tail lights, new dashboard for interior, etc. 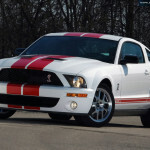 Frankly, it looks like Shelby started to loose its “sought after” feature by modifying “simple” Mustangs into Shelby ones in their Shelby Mod Shops and listing them in Shelby registry as pure-blooded. We do expect that only the real production Shelbys will maintain and even increase their historical and financial value in the future.